Last year’s event sold out so don’t delay — register today! 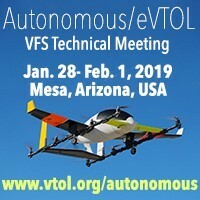 8th Biennial Autonomous VTOL Technical Meeting & 6th Annual Electric VTOL Symposium takes place in Mesa, Arizona January 28th – February 1st. This biennial meeting is an excellent opportunity to learn about and discuss with researchers and leaders in academia, industry, and government agencies from around the world the latest advancements in manned/unmanned, electric/hybrid/turboshaft-powered, and civil/military autonomous VTOL aircraft technology. The meeting will feature three days of technical presentations, Jan. 29-31, plus 2 short courses on eVTOL taught by industry experts. These courses fill up fast so register today! DATE CHANGED FROM THURSDAY TO FRIDAY! 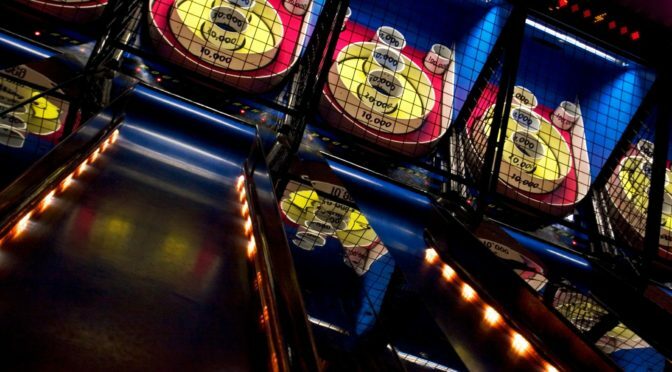 The Arizona Chapter of the Vertical Flight Society will be hosting a holiday mixer family event at Dave and Busters in Tempe Marketplace on Friday, December 7, 2018. Appetizers will be provided, so bring the whole family for a cash bar, social networking, games, and a Bell 407 model raffle! Tickets are on sale below or available at the door. All RSVPs need to be made by November 30th by purchasing a ticket or sending an email to RSVP@vfsaz.org. All proceeds go to the Dr. Fredrick Straub Memorial Scholarship fund. The flyer is available here. Our Chapter sponsored the 6th annual Micro Air Vehicle (MAV) Competition which was held during Forum 74 at the Phoenix Convention Center on May 14th, 2018. Three University teams competed In the Autonomous Category with Vaughn College (Aerial Robotics) receiving $1000, University of Maryland (TerpCopter) received $500 for their package delivery system, and Penn State (Nittany Jugaadus) received honorable mention for their image recognition. Two teams competed in the Manual Category with Vaughn College (UAV Club) recieving $2000 for “Best Remote Target Search” and University of Maryland (RC Flying Terps) winning $1500 for their “Innovative Design”. Stay tuned for the 7th annual MAV Competition to be held January 19th, 2019 during the VTOL Symposium held in Mesa, Arizona. On April 14th, 2018 our chapter supported the joint Aviation Picnic with Army Aviation Heritage Foundation (AAHF) and the AZ Chapter of the Army Aviation Association of America (AAAA). The AAHF even provided Cobra Helicopter rides! On April 11th, 2018 our monthly chapter dinner presentation was provided by Moses Koyabe, Vice President of Business Development at Ideal Aerosmith Inc. Moses provided a dynamic and enlightening presentation on the future use of drones to carry out services critical for rural and urban communities. His presentation entitled “The Sky’s the Limit, the UAS Industry in Arizona” showed the enormous possibilities that lie ahead for the unmanned air vehicle systems. On March 24th, 2018 we had our annual family event at Kiwanis Park in Tempe. Activities included our annual Chili Cook-Off, along with demonstrations from the ASU AHS Chapter showing off the latest technologies used in their small drones. What a fun event for the whole family! On February 8, 2018 our local chapter joint hosted a dinner meeting with AAAA featuring Joe Sarno, a Boeing Senior Manager and retired United States Marine. Joe provided a fantastic presentation on the V-22 “A Bold Tilt to the Future”. For our January Dinner Meeting, Greg Peterson (Boeing Program Manager) provided an enlightening presentation on the Joint Multi-Role (JMR) Program. Truly incredible to discover what companies working together can design and ultimately produce. Don’t miss our 25 October 2016 dinner, with guest speaker David Koopersmith, VP/GM Boeing Veritcal Lift & AHS Int’l Board of Director. See http://vfsaz.org/activities/ for more information. The Arizona Chapter’s announces that its scholarship fund is now named to honor our respected Technical Director Dr. Friedrich Straub. This scholarship fund is now the Friedrich Straub Memorial Scholarship Fund. The world's premier vertical lift technical society.